What do you get when you combine the beautiful scenery of the Sunshine Coast with a passionate group of local roasters... an official coffee trail! Flying West, along with five other local roasters, joined forces to create the Coast's first and only coffee trail, highlighting not only the amazing coffee on order, but also the 60 local cafes serving up their fresh beans. Launched this year by the Sunshine Coast Roasters Guild, The Coffee Trail website provides an interactive map for visitors to find cafes nearby as well as events, training and demonstrations. The Sunshine Coast as a collaborative coffee destination is our key focus, and as roasters, we have a common vision to create an experiential coffee destination. By working together, we can show people that there are several great, quality roasters and point them towards cafes serving our coffee. "We're trying to put the Sunshine Coast on the map as the place to go for the best quality of coffee in Australia," said Ben West, founder of Flying West Coffee Roasters. "We want to be recognised as a coffee destination. We want people to say "let's take a holiday to the Sunshine Coast and check out the coffee trail". We want people to visit the roasters and see what we're all doing because we're all doing great things here." The Coffee Roaster's Guild was the first of its kind in Australia. Launched in 2015 at the Maleny Real Food festival, the six founding members wanted to showcase the outstanding quality of locally roasted coffee. By working together, the members seek to enhance the coffee experience for locals and visitors to the Sunshine Coast. 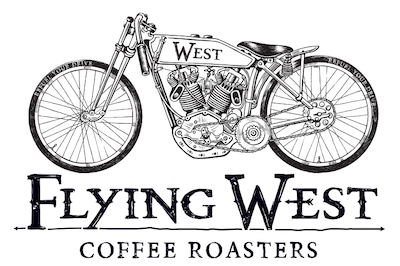 "By supporting each other, we can not only improve the quality of our own product, but the quality of the region's coffee," said Nina West, founder of Flying West Coffee Roasters. "And it's great to be involved with the other roasters and work together to grow the region's specialty coffee industry. I'm excited to see how the Guild and the Coffee Trail changes and evolves over the next few years." As members of the Flying West family, each one of our Sunshine Coast cafes (as of June 2017) is listed on The Coffee Trail website's interactive map. This makes finding one of our cafes easy and accessible for locals and visitors. An accompanying printed brochure also lists each of our Sunshine Coast cafes. Jump on The Coffee Trail website and The Coffee Trail Facebook page to find out more and show the love. We're excited to see it take shape and grow!